When architects play with angles, the results are sometimes surprising ! We have completely fallen in love with the harmony between this wooden structure and the brown shades of the tiles ! What a stunning roof ! What do you think about this kind of unconventional roof ? Tibet, the average elevation of 4,000 meters or more, is known as the "roof of the world". 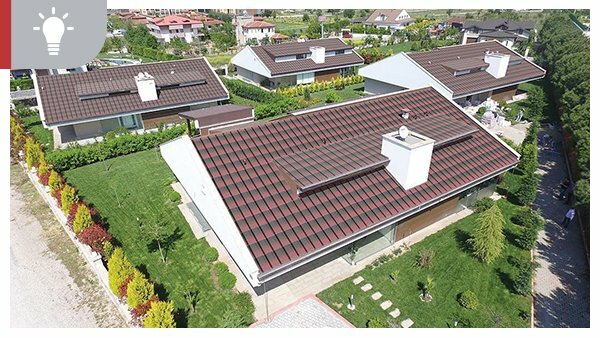 The local characteristics - strong ultraviolet light, huge temperature difference between day and night, strong wind, big snow - put forward very high requirement for weather resistance of roofing tile. Now, on the "roof of the world", Onduvilla black replaced red color metal tile commonly used in Tibetan areas. One is the policy environment. In August 2015, President Xi led the Sixth Central Tibet work forum held in Beijing，to use "long-term construct Tibet" policy to replace the former policy "aid Tibet", with the living conditions of the herdsmen greatly improved. Since 2006, a large number of housing units have been built, as an important part of the Central People's morale project. In the past, the houses were usually made of low-end metal tiles, resin tiles and other low-end tiles. Some drawbacks are highlighted in the harsh natural conditions in Tibetan areas. Therefore, the central leadership at the meeting explicitly requested the use of new tile instead of the traditional color steel tile. Hanzhoungxingyuan New District and several other projects are using Onduline Group products, received good use effect, and impressed the designer. So the designer is confident about Onduline Group and its products, designing and strongly recommending the Onduvilla. The designer also considers the corrugated asphalt tile in our company very suitable in this region, so design the above grey indigo Onduvilla. At the same time we also vigorously communicate with the local government, let the leadership of the government trust and feel the advantages of Onduvilla, and finally determined that the resettlement housing of Nyalam town of Tibet in Nielamu would be made by Onduvilla. Seaside + Sunshine + The green shades of this Onduvilla = the perfect place to find calm and peace ! Could you guess where does the design of this beautiful Onduvilla come from? Who said that we cannot mix modernity and tradition? This impressively charming #manor proves that it's definitely possible! A hidden #workshop or a nice #storage for your gardening tools… This wooden cabin is the perfect place! We do not see double but triple with this wonderful #Onduline roof!